February 5 is known as Safer Internet Day. Google is trying to get this attention to the users. In the same sequence, Google is providing information to keep its users safe while keeping their accounts secure and surfing the web. 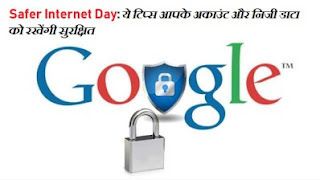 Google is suggesting several ways to stay safe online under the #SecurityCheckKiya campaign. At the same time, the company is asking its users to keep their phones, data and accounts secure. This will always keep users safe while surfing online. Here we are telling you the three easy ways described by Google under Safer Internet campaign, so that your data and account will be safe. Android users have been asked to download the app only from Google Play Store. Each and Every Android device comes with Google Play Protect service. Under this service, more than 50 billion apps are scanned every day. After scanning, the dangerous application is removed from the platform. Google has also said that users should keep their phones locked with a unique password. In addition, users should not believe any kind of biometric data. Third-party applications ask users to access the location, contact, camera, microphone and storage. Many of these apps are also those that do not work properly without access. In such a way, Google is advising users to allow users to access only these applications through which this app can work properly. Users will also be able to see which permissions they have given to a third party app. To view this, users will have to go to settings. After that go to Apps & Notifications and tap Advanced. Now by visiting App Permissions, you will find information about which app is given to you. Every user should ever do a health check-up of his / her Google account. The company is asking the users to check the security of their account and desktop. For the security checks of desktops, users will have to go to a Google account. After this, Security Check will have to run. Users of mobile will have to go to the Gmail app. Next, go to the Menu icon and tap on Settings. Now go to Tap Manage Your Google Account on the ID. After this, you have to run Security Check. Apart from this, users can go to g.co/securitycheckup.